Gift ideas for Dancers, Acrobats, Gymnast, Cheerleaders & Tumblers! Every dance style aims for athletes to have a beautiful split. I personally used this product when training! This continuous-loop dance strap from PlumBand is a must for dancers, gymnasts, and cheerleaders. Improve your balance, strengthen your muscles, & increase your flexibility all with one easy-to-use, carry, and store stretch band. I absolutely love this product! Air floors make our tumblers feel safe practicing beginner & advanced skills at home. Now there are tons of Air tracks/floors listed online, but you really have to do your homework to ensure you are getting a quality product, because yes... they are expensive. I actually have a student who sold all her toys this year so she could get tumbling equipment! Excerise or video games guys..umm? I have found two mats that are pretty much the same quality, one is 4 inches thick & the other is 8 inches thick. I would suggest the 4 inches for athletes working on front & back walkover overs and 8 inches for athletes working on back handsprings, tucks & layouts. Basically, beginners should be using 4 inches advanced should look at investing in 8 inches. Now if you are looking for a less expensive version of these mats you could get a Air Beam. They are much narrower but they provide the same bounce and stability. A ton of my clients already rock and have bought these mats! I personally use the brand Tumble Trak, which I have listed below but there are a couple other more economical options available now! 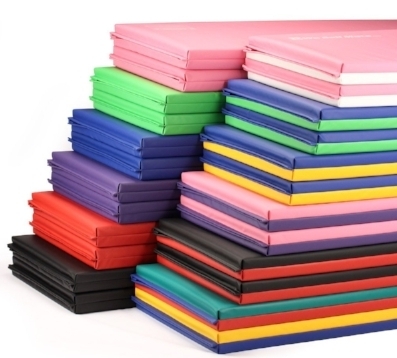 Regardless of what brand you purchase these mats are great because they store super easy. The four panel folding future allows you to fold them up and pop them in your closest. I also love the vinyl cover because it's very easy to clean, which means you can use it for those sleepover parties! OH! AND you can buy a ton of them & Velcro them all together to make your own tumbling runway indoors or out! Please do your athlete a favor and buy the 2 inch thickness. Incline Mat AKA "The Cheese"
Incline mats are great so learning somersaults, handstand to bridge, front/back back walkovers & back handsprings. I love this incline mat because it folds into a box shape so I can prep my tumblers for back tucks. I use my cheese mat A LOT for drills & strength, my personal favorite is having my athletes place their hands on the top of the incline, push to handstand and flip over. I also use this mat a ton with my tiny tots, pushing, jumping over and running down it is excellent for their growing bodies. When it comes to the incline mat I only have one trusted source Tumbl Trak! Click below to purchase! 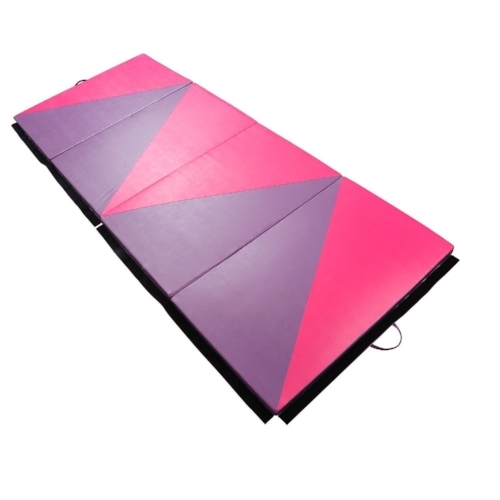 Tumbl Trak also makes a wonderful mat for guiding athletes to a perfect cartwheel! I love the double sided bonus for keeping their cartwheels straight, this helps me prepare my athletes for good strong aerials down the road. You can also use this mat for front and back walkovers! I'm sure you are reading this and going a WHAT? Why would my child need this. Well, do you want to stand there and lift your child over & over after a long day at work? Maybe you have a back injury? Or maybe your an expecting mother...or your just plain tired (#lazylife). Take it from someone who literally lifts children & teenages all day, you can really hurt yourself! The octagon tumbler allows your athlete to practice front/back walkovers & back handsprings with little to no help! After I used my first octagon tumbler I bought my second size- yes the size does matter. I have attached a video to give you an idea of their uses & sizes. I would not suggest buying directly from Tumbl Trak-it will cost you more money in shipping and border fees.